The stunning new disc by John Potter combines history and a modern view; Thomas Campion, plus commissioned settings of old texts by John Paul Jones (of Led Zeppelin) and Tony Banks (of Genesis). 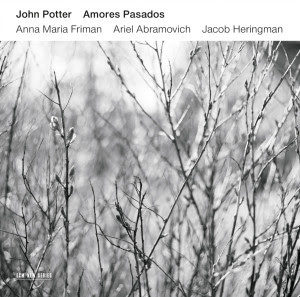 NOTE: All of the music on this program is from the recent release from John Potter and his ensemble. The recording is on the ECM label and is CD ECM 2441. From Sequenza 21:John Potter is best known for his work with the recently disbanded Hilliard Ensemble (writing recently disbanded for that estimable group is saddening indeed). But he has kept an active profile as a soloist as well. On the ECM label, he has focused on lute songs, with albums devoted to the Dowland Project. Anna Maria Friman is a member of Trio Medieval, who also record on ECM. They are joined by lutenists Ariel Abramovich and Jacob Heringman on Amores Pasados, a most imaginative project. The central repertoire are lute songs written by rock musicians: John Paul Jones (of Led Zeppelin), Tony Banks (of Genesis), and Sting. Potter and company have also included selections by 16th century composer Picforth and by John Campion, a 17th century composer famed for his lute songs. Rounding out the recording are Potter and company’s arrangements of songs by early Twentieth composers and compatriots E.J. Moeran and Peter Warlock. For those who misread this as one of too many “casual” crossover projects, don’t forget the background of the pop musicians involved. Tony Banks played 12-string guitar on the early Genesis albums, Sting has recorded an entire album of songs by John Dowland and Robert Johnson, and John Paul Jones is a versatile and formidable musician. This is in part why the results of this collaboration are so successful. The other factor, of course, are the performances. Whether in tuning the achingly beautiful close part harmonies in Jones’s No Dormia or navigating the harmonic and rhythmic shifts found in abundance in Banks’s “The Cypress Curtain of the Night,” Potter, Friman, and their lutenist colleagues prove skilful and sympathetic collaborators. They make no pretense to be pop singers, performing with classically trained singers’ diction and tone. The way they manage to meet these songs in the middle is rhythm and phrasing: they readily adapt to the syncopation that is ubiquitous in pop songs and amply present in those collected here. II. 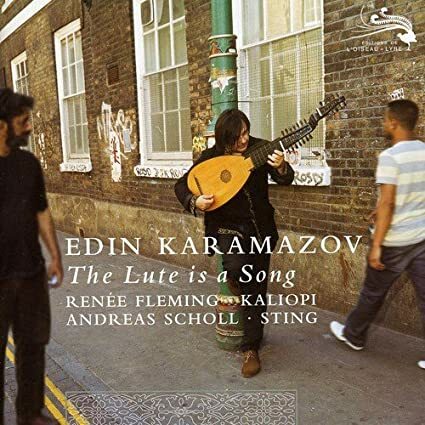 Edin Karamazov: The Lute is a Song (Edin Karamazov, lute). L’oiseau-lyre CD B0013278-02. GIOVANNI ZAMBONI (fl. c. 1700): Sonata.